England v Ireland Six Nations rugby hospitality at Twickenham Stadium-Saturday 17th March 2018 in London. 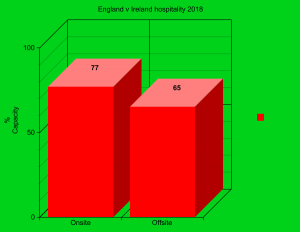 If you’ve never experienced the unique, friendly and “craicling” atmosphere of an England v Ireland hospitality experience at Twickenham STadium, it’s time to start. There can be no other sporting event that induces such levels of raucous rivalry than this. The free-flowing crowds of green and white, the free-flowing cool dark Guinness and the importance of this historic fixture makes it a not to be missed occasion. Ireland thwarted England’s Grand Slam ambitions in a sunny Dublin on St Patrick’s weekend in 2016 and England are keen to beat the greens this time round. These Official hospitality options are the only way to entertain if you need to wow your best clients. Whether you’re enjoying the intimate surroundings of your own private viewing box or embracing the camaraderie of a shared VIP lounge, the atmosphere at an England versus Ireland rugby match at Twickenham is incredible and tickets are like highly desirable green-dust. This is the ultimate sold out ticket for The Six Nations and one of only two home games at Twickenham AND it’s on St Patrick’s Day. Will England win the Grandslam, will Ireland spoil the party, will you be there? Over 2,000 hospitality covers NOT available for the 2018 series whilst the East Stand is being redeveloped so get yourself sorted soon…..